(JTA) — A prominent rabbi in Berlin called on other Jewish community leaders to do everything in their power to prevent additional countries from leaving the European Union after Britain’s vote to exit the bloc. 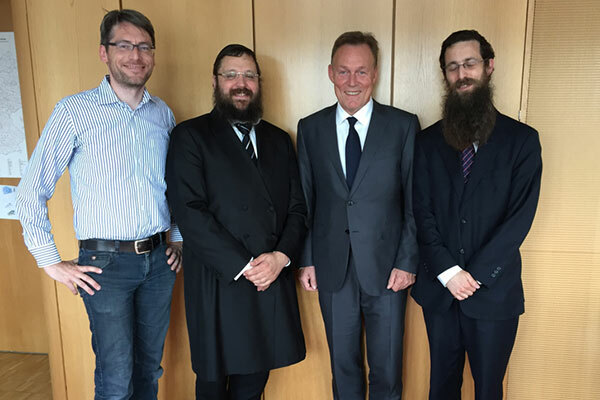 Yehudah Teichtal, a rabbi of the Jewish community of Berlin, made the call Tuesday in a statement about his meeting with Thomas Oppermann, the head of the German Social Democratic Party’s faction in the German parliament. Teichtal told Oppermann that in his conversations with European rabbis and Jewish leaders he “encourages them to take action and prevent any further breaking in the EU,” the statement said. “I call upon the leaders of all Jewish communities around Europe to do whatever they can and execute all of their influence” to prevent additional exits, the rabbi was quoted as saying in the statement by his office. Teichtal’s statement follows the June 23 vote in Britain, in which 51 percent of voters supported a British exit, or Brexit, as British media has dubbed the initiative. While this issue has divided British Jewry, several European rabbis issued calls similar to Teichtal’s. Only such an attitude, he said, would address the issue that the supporters of leaving the union have with the bloc, namely that “Brussels imposes laws for all its member states, and does not properly take into consideration the individual cultures and needs of the member countries,“ as Loewenthal described this attitude.